The TFH Infinity Tunnel is sound responsive, LED, and provides individual reactive control. 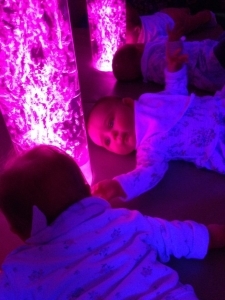 Babies and Seniors love a Sensory Room. Long Term Care is a challenge to anyone, TFH provides the Sensory Breaks! During their hospital stays, many patients are confronted with much that is unknown, unfamiliar and uncomfortable. When the patient is a child, especially one living with a chronic disease, the tests, surgeries, treatments and down time can weigh heavily, resulting in stress, anxiety and frustration — not a good prescription for getting better. Toronto’s Sick Children’s Hospital has an unusual fix for what ails some kids — a therapeutic space called the multi-sensory room. The room, is the first of its kind in a Canadian hospital. It was designed with TFH Canada (SpecialNeedsToys.ca) to help provide pain control without drugs and to relax or stimulate, as needed, certain pediatric patients. Child life specialists — health care professionals who help and support young hospital patients — determine whether a child would benefit from spending 30 to 45 minutes in the room with a specialist. 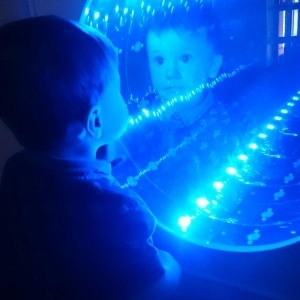 Not every child at the children’s hospital will use the multi-sensory room, and it isn’t something parents can request. When the room is in use, it is quiet or provides sounds from any Mp3 or Apple device. The floor, walls, ceiling and padded furnishings are all white. But while a child is using the room, it becomes a place of his or her design. It can pulsate with music, patterns and colors of the child’s choosing. A remote control device called the MSE Genie App (free to download) lets the patient change the variables in the room with an ipad or soft play cube..
Four floor-to-ceiling lighted bubble tubes — acrylic tubes filled with water and effervescence — are a favorite with kids and adults, and there is a projector that displays patterns and themes that can make the room take on the look of a lava lamp, the universe, the alphabet and more.